These are the words Kahan and executive chef Brian Huston use to describe the carefully chosen, constantly changing menu at The Publican. Upon entering through a glass vestibule, the first thing we noticed was the restaurant’s stunning design. The main dining area is awash with earth tones and divided by a long L shaped communal table meant to recall the air of 16th Century banquets. The far wall is lined with 4 tops, each enclosed by large wooden swinging doors. Another pillar of the restaurant is its beer menu, which is crammed into a full legal size page. Having been recommended Indiana’s Three Floyds Brewery by our waiter and barman the evening before, I began with the Jinx Proof Pilsner. 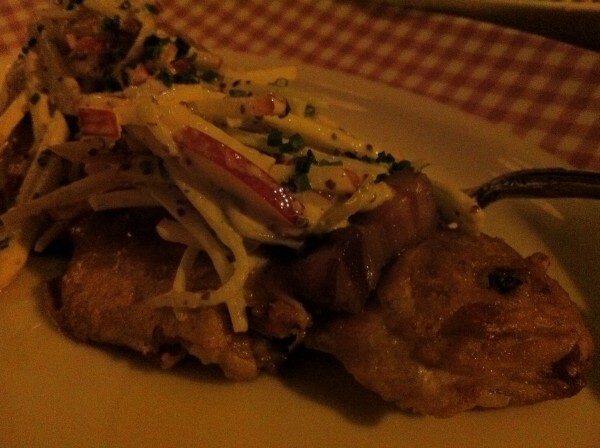 The salad with crispy pigs ears was a great, crunchy way to start the meal and paired well with the light Pilsner. We also ordered a Sidecar cocktail, although it’s worth noting that mixed drinks are not a house specialty. I particularly enjoyed the generous amount buttermilk vinaigrette which was creamy but not overpowering. The turkey balantine was rich and earthy – cooked just right with a savory finish. My absolute favorite of the night was the golden trout with bacon, apples and celery root remoulade. This was one of those dishes that challenged you to grab all the elements on your fork for one bite. Every flavor was distinct and beautifully layered and the bacon was cut into thick cubes. Originally we had planned on finishing with a duck heart dish, however because our reservation was later in the evening we missed out as this seemed to be one of the more popular dishes that night. Our waiter was really great about it and recommended the country ribs instead. Faced with the choice of a full or half portion, we went for a full portion and ordered more drinks – more determined than ever. We were soon served a Pimm’s Cup cocktail and an extremely light Belgium wheat ale. The full portion of country ribs were huge and quite filling. These are not what traditionally comes to mind when ordering ribs, particularly as the meat was as thick as a steak. The taste was spot on and we barely managed to finish the plate. Finally for dessert, we were told that the house specialty was the waffles with honey butter and rhubarb jam. Apparently the restaurant has a special industrial style kind of waffle machine that is rarely found in kitchens anymore and wouldn’t you know it – makes the most amazing waffles. How could we say no! We were also treated to a dark stout coffee beer (fantastic). The waffles were perfect – light, fluffy and crispy. We adored our meal at The Publican, this place is a must for anyone in the Chicago area. Tags: Apples, Beer, Chicago, Cockatils, Publican, Ribs, Salad, Trout, Turkey, Waffles.